Earlier this month, I wrote about a model of a scale house that I plan to build this summer. I mentioned that I’ve been collecting information (and many readers offered suggestions on sources: thank you!) but there’s one place I should’ve looked right from the start. 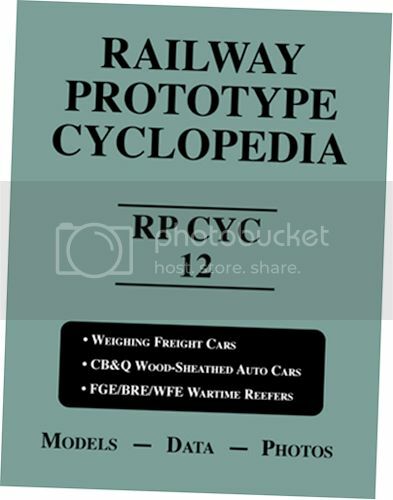 The Railway Prototype Cyclopedia – now at 29 volumes – is a marvellous resource for prototype modellers. While scanning the covers to look for information on another project, the words WEIGHING FREIGHT CARS jumped at me off the cover of RPCYC-12. There are several drawings of the scales themselves, which answer many questions about how to model them. And I didn’t even know about the scale tool car – a car that would often accompany a test car to calibrate and maintain the scales being tested. The examples in this article are from the Baltimore and Ohio, but I’m now going to keep my eyes open for similar cars on the Canadian National Railways. I really do need to remember to check my own resources. In the case of the RPCYC, I should make a habit of checking the covers whenever I embark on a new project – especially one involving rolling stock. This entry was posted in equipment, resources, Scale House and Scale Test Cars by Trevor. Bookmark the permalink.